At its core, recruiting is about building and sustaining talent communities of people you’d like to bring on board now – and in the future. And nothing nourishes communities like conversation that is engaging, informative, insightful. 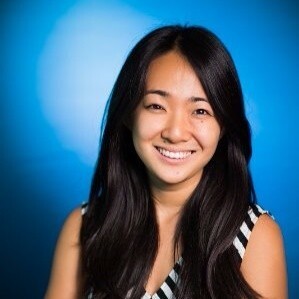 That’s why we’re excited to announce the rollout of Pages, the next generation of LinkedIn Company and Career Pages. 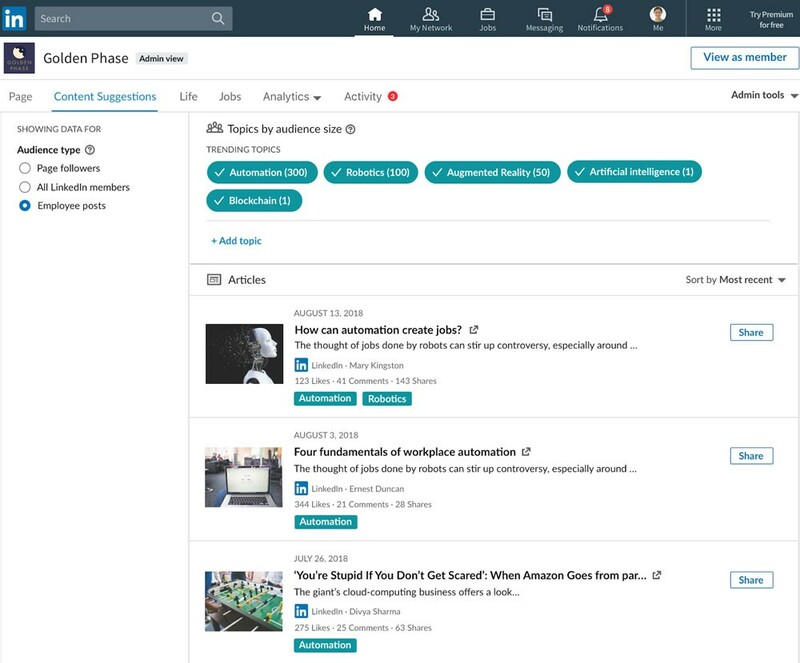 Pages has been redesigned to make it easier for companies and organizations to share insights and actionable information with LinkedIn’s community of more than 590 million members. You can enhance your Page with Career Pages, which gives you a way to engage potential candidates with a Life tab and a Jobs tab that provide a customized look into your organization, culture, and jobs. Our new Career Pages design gives you more ways to engage with job seekers, sharing what makes your company, your culture, your employees, and your job postings stand out. We’re also making it easier to engage in conversations with the Pages newsfeed, which enables you to provide ongoing company updates and encourage comments from current and prospective talent. One of the most noticeable changes to the Career Pages redesign is an intuitive left navigation bar that allows members to quickly and easily access all the various sections of your page to discover what your company has to offer. 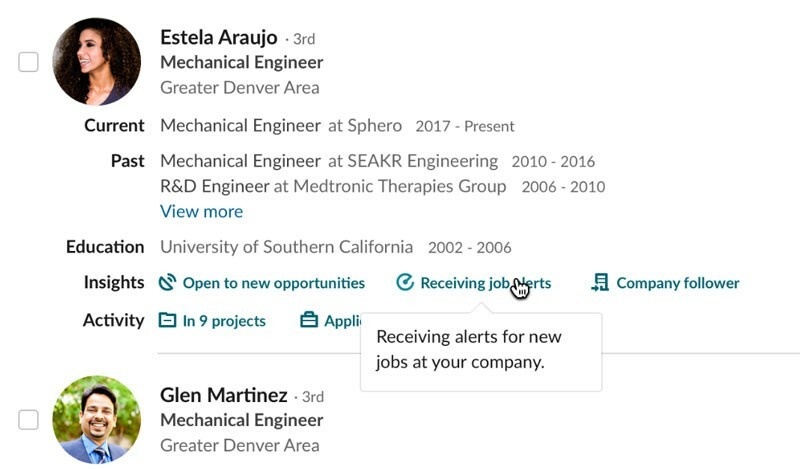 On the Jobs tab of Career Pages, LinkedIn members can now create a job alert to receive in-app notifications any time you post a new position that is relevant to their profile. Then, LinkedIn will filter these active candidates for you within LinkedIn Recruiter for more efficient sourcing. Recruiters can also leverage this insight as a point of entry when they send an InMail to a potential candidate. Based on our research, job seekers who ask for alerts are highly engaged. Members who have created a job alert apply to 20% more jobs per session on LinkedIn than our baseline job seekers and their click-to-respond rate for those requested job notifications is twice what we normally see. When we looked at the traffic flows in and out a company’s Career Pages, we found an interesting thing happening: About 40% of job seekers immediately visit the profiles of that company’s employees or start searching for employees with similar titles. The Jobs tab on your Career Pages will now surface both recommended jobs at your company (based on the visitor’s profile) and employees who already hold positions with similar titles. We’ll include their names, title, location, and degree of connectedness to the member. Job hunters will no longer have to scramble to find out who their potential peers are. They can immediately reach out to those possible teammates to find out what the company, team, and job are really like. Why? Because employees are seen as the most credible source of information about companies. In the 2018 Edelman Trust Barometer, 71% of respondents said that employees were more believable than CEOs. Which, of course, makes employees your best brand ambassadors. We’ve built Career Pages to give your company more tools to shape its talent brand. 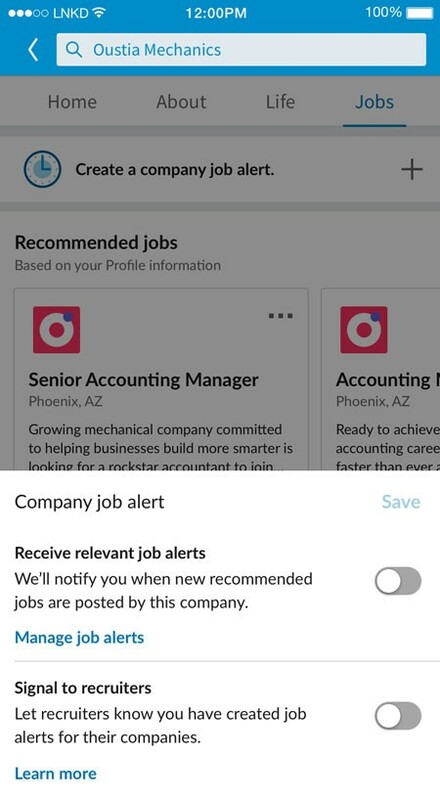 The administrators of your Career Pages can now post updates and respond to comments on the go by using the LinkedIn mobile app. Admins have always had the ability to post images, video, and text to your Pages. But now they can share documents — PDFs, Word docs, or PowerPoint presentations — to tell richer, deeper stories. As noted earlier, your employees are your biggest champions and your best talent salespeople. Amplifying their voices will build stronger connections with your audience. 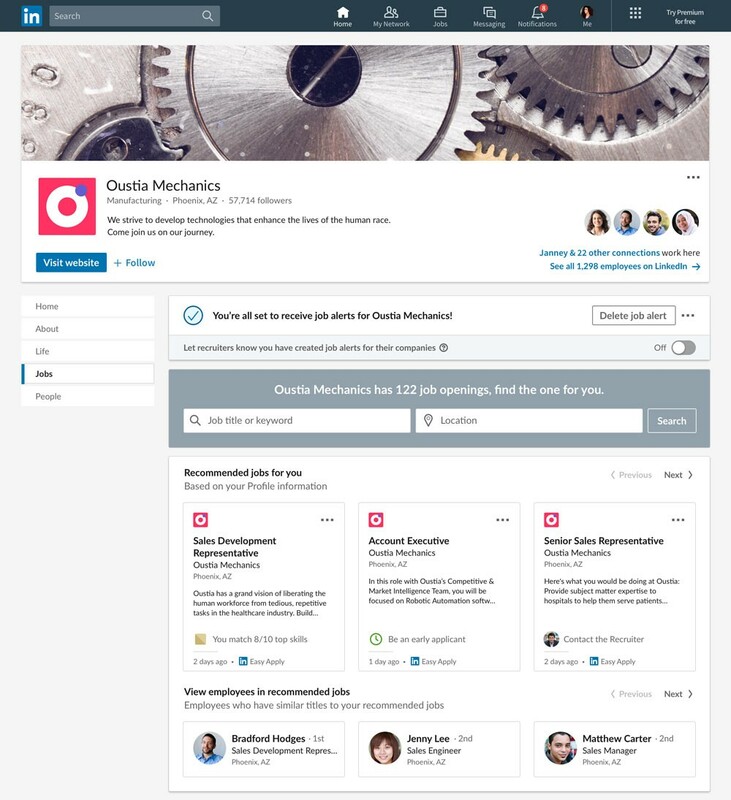 New functionality gives your admins the ability to discover and reshare your employees’ public LinkedIn posts on your Career Pages. We have also introduced a capability that enables admins to respond to and reshare any LinkedIn posts, such as testimonials and product reviews, in which your company is mentioned. 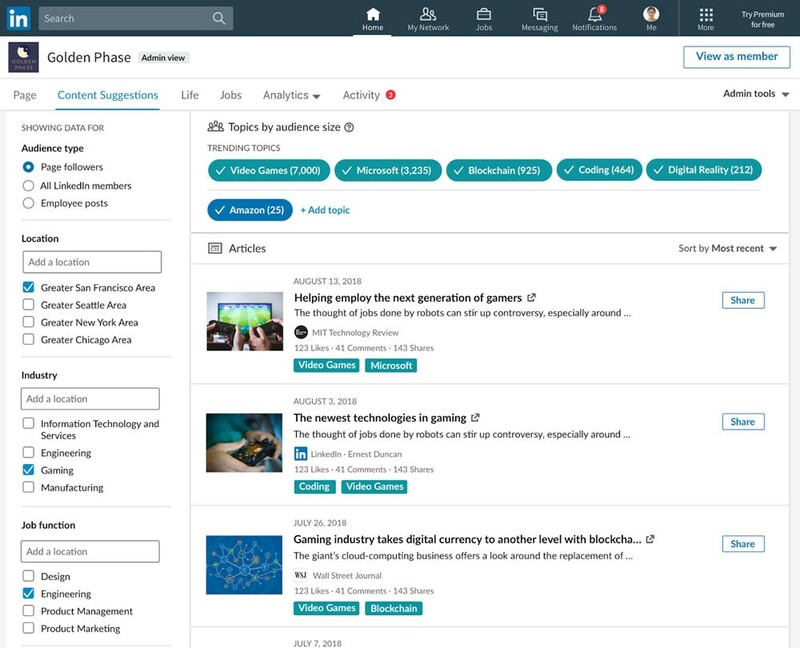 Finally, Content Suggestions is a new feature that shows you the topics and content on LinkedIn that are trending with your target audience, allowing you to create and curate content that your talent pool will eagerly engage with. We’ve highlighted three key features of the redesigned Pages, but there are many more, including brand-new analytical tools that will give you a clear view into how job seekers are engaging with your company — and with your competitors. You can learn more about how Pages works and what it can do for you by visiting here. We have rolled out Pages in the United States and will make it available to companies and organizations worldwide over the next few weeks.